OAK GROVE, La. 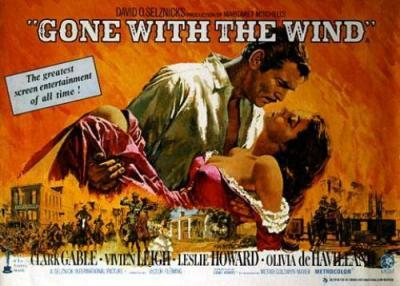 — Deemed the greatest motion picture ever made by most film historians, Metro Goldwyn Mayers’ “Gone With The Wind” will light up the screen of the Historic Fiske Theatre for one night only this Saturday at 5:30 p.m.
Gone with the Wind is a 1939 American epic romance-drama adapted from Margaret Mitchell’s 1936 novel of the same name. It was produced by David O. Selznick and directed by Victor Fleming from a screenplay by Sidney Howard. The epic film set in the Old South in and around the time of the American Civil War, stars Clark Gable, Vivien Leigh, Leslie Howard, Olivia de Havilland, and Hattie McDaniel. It tells a story of the American Civil War and Reconstruction Era from a white, Southern point of view. It received ten Academy Awards (8 competitive, 2 honorary), a record that stood for twenty years. In the American Film Institute’s inaugural Top 100 Best American Films of All Time list of 1998, it was ranked number four. It has sold more tickets in the U.S. than any other film in history, and is considered a prototype of a Hollywood blockbuster. Today, it is considered one of the greatest and most popular films of all time and one of the most enduring symbols of the golden age of Hollywood. Besides playing at the Old Fiske Theatre when it was released in 1939 Mr. Fiske participated in its 25 Anniversary re-release playing it at the New Fiske Theatre in 1964. The box office will open at 4:30 p.m. and due to the length of the film the concession stand will expand its menu to include hot dogs. The Fiske Theatre is operated by the W.C. Chamber Fiske Theatre Board with proceeds from all events at the theatre going toward theatre upkeep, operation and future improvements to the theatre. This entry was posted in Uncategorized and tagged Fiske Theatre. Bookmark the permalink.